The Sony Optiarc (NEC) equipped StorDigital duplicator is a standalone optical copier that can be purchased in a number of size configurations to suit every need. 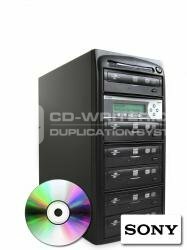 With a simple-to-use four-button controller, your duplicator can be fitted with one target, or anything up to 15 burners for you to produce copy after copy of your own DVD movies, music collections, catalogues, presentations etc. With Sony Optiarc writers in your copier, your CD-R, CD-RW, DVD-R, DVD-RW, DVD-DL, DVD-RAM discs can be burnt with a minimum of wastage - with speeds of up to 24X for DVD+/-R. You can also opt to have your duplicator fitted with a hard drive that can give you up to 2TB of on-board storage. One of the main benefits of having a hard drive fitted to your StorDigital Premium duplicator is increased stability of the master data. This means that the Sony Optiarc writers can be operated at a higher burning speed than when the master data is coming directly from the DVD ROM - this adds up to an increased output of copied discs per hour.